The Guardian: After two rarely seen shoestring failures, the 27-year-old Stanley Kubrick was attracted by Clean Break, a low-budget novel about an ingenious racetrack robbery by pulp writer Lionel White, and by the $320,000 budget raised by his new partner, James B Harris. The pair moved to California to shoot the picture on location in LA, at Charlie Chaplin’s old studio and at a San Francisco racecourse. Everything went speedily and well and the movie brought professional fame and critical respect to both, though due to a wilful failure by United Artists to publicise the film, financial success did not come to Kubrick until Spartacus. 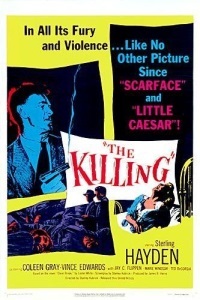 Harris and Kubrick hired hardboiled, low-life author Jim Thompson to write the dialogue (his first film), persuaded Lucien Ballard (soon to become Peckinpah’s regular cameraman) to undertake the high contrast black-and-white cinematography and got Sterling Hayden, the leading heavy in The Asphalt Jungle, to lead a gang of familiar faces with little known names as the bruised, sympathetic losers executing the heist. Among them are perennial fall guy Elisha Cook Jr and shop-soiled femme fatale Marie Windsor. Slant: Stanley Kubrick’s 84-minute jigsaw puzzle transports the dancing moral contortions of film noir to the pressure-cooker atmosphere of the track, infusing them together with dread-inducing temporal uncertainty. This story of low-level hoods and unlikely schemers planning to rob a Los Angeles racetrack condenses the moment-to-moment plotting typical to the heist movie, revealing a nonlinear, fractured narrative seething with anger. Like a splash of cold water to the face, Kubrick institutes a dry, almost clinical voiceover to chart the progress of the robbery, introducing each man’s hidden reasons for letting their freedom ride. The sobering audible device echoes Dragnet in all the right ways, speaking in past tense as if these men were ghosts foolishly trying to change what has already been predetermined. Johnny Clay (Sterling Hayden), just released from a five-year stint in prison, instigates the operation, recruiting inside men from the track like bartender Mike O’Reilly (Joe Sawyer), bookkeeper Marvin Unger (Jay C. Flippen), and clerk George Peatty (Elisha Cook), along with corrupt policeman Randy Kennan (Ted DeCorsia), to orchestrate the daring heist. Each represents a specific role in the intricate process, a key piece to the overall puzzle. How they fit together and break apart becomes Kubrick’s core interest. The men of The Killing all believe their newly acquired riches will salvage whatever opportunities they’ve previously squandered. Johnny needs the cash to run away with his innocent lover, Fay (Coleen Gray), and the motif continues down the line; Marvin wants to sustain a strange paternal relationship with Johnny, Mike hopes to cure his sickly wife, and Randy intends to free himself from a brutal loan shark. But it’s the weak-willed George who becomes the final straw on the camel’s back. George naïvely believes the money will satisfy his wide-eyed viper of a wife, Sherry (Marie Windsor). Her passive-aggressive interrogations are ripe with assaults on George’s nonexistent masculinity, and what begins as idle pillow talk quickly avalanches into full-blown disaster. In the heist film, any one character’s faith in the group can dissolve in favor of self-survival at a moment’s notice. Early on, Randy even warns, “I’ll take care of myself. That’s my specialty.” And as the mistakes pile up, making a once carefully modulated plan on paper turn to dust, The Killing constantly threatens to fulfill such genre conventions. But Kubrick withholds the expectation of capture, betrayal, or death until the last possible moment, stretching out Jim Thompson’s bullying and brilliant dialogue sequences, juxtaposing them with hypnotically fluid long takes through clogged interior spaces. These precise visual aesthetics suddenly explode with violence, best exemplified in the moment thuggish Maurice (Kola Kwariani) stages a planned brawl in the track common area, taking on a platoon of cops in the process, or when Johnny watches sniper Nikki Arcane (Timothy Care) shred a paper target with automatic shotgun fire. Violent uncertainty like this infects every corner of the frame. Roger Ebert: Sterling Hayden was a considerable screen presence with his tough guy face and his pouting lower lip. His gravel voice lays out instructions and requirements in a flat, factual manner; his gang members take them at face value. He never displays much emotion, not even at the end, when a great deal might be justified. We don't see passion, fear, greed. He could be a chess player in the Zone. He has a streak of nihilism. The most colorful players are Marie Windsor, famously known as Marie Windsor, and Elisha Cook, famous for playing milquetoasts and chumps in the movies of four decades. She wraps him around her little finger, and he comes back for more. Empire: Kubrick was always great with actors: notice how much more Hayden does here with apparently less to go on than in the similar The Asphalt Jungle (1950), and the way familiar film gangland types like Cook, Windsor, Sawyer and Flippen manage to cram lifetimes of aching disappointment into a few intense yet understated scenes (the dialogue is by hard-boiled novelist Jim Thompson). AV Club: Even when the heist components fail to snap into their proper place, the movie itself unfolds near-perfectly. Kubrick gets in and out by the 90-minute mark, hurried along with sharp, rapid jabs of Jim Thompson dialogue (he and Kubrick adapted the Lionel White novel Clean Break). The camera also moves with a momentum that seems impossible, especially during a signature series of side-view tracking shots that keep characters in the frame as they charge through multiple rooms and doorways. Lucien Ballard’s black-and-white cinematography captures the comings and goings with perfect clarity. Kubrick, only in his late twenties at the time of the film’s 1956 release, would go on to make more ambitious movies—almost exclusively, in fact. But it’s with equal expertise that The Killing applies his formal control and gift for pitiless (though not quite empathy-free) observation to genre-picture pleasures. He was supposed to be making his big-studio calling card; as it happened, he made a great heist movie too. I saw this recently, and really enjoyed it. The cast is pretty great -- Sterling Hayden as the ringleader in particular, but also Marie Windsor, with her cruel indifference and great jabs at the husband she's so clearly done with. The pacing is wonderful, and the use of time (where we repeatedly jump back to see how another key player prepares for and arrives at the scene of the heist) is really noteworthy. We end up seeing the opening of the 7th race (the time of the heist) a good half dozen times, each capping off Kubrick having set another key player in place, with tension mounting. When we finally see the heist go forward it's been built up beautifully, and it really lives up to the build-up. If I have any criticism it's that the ending is fairly telegraphed, and I kinda wonder if a different ending might have been possible if not for the still-sorta-enforced Hays Code at the time of production. But, that's kinda nitpicking. It's really worth seeing! Tim Carey was a treasure. Way back in college I took one film studies class and this was one of the films--on film no less! Reading this so made me want to watch it again, but alas not on Netflix, iTunes, or Amazon.